Bacon, whiskey, peanut butter, and maple syrup meet in one tasty little shooter called the big fat Elvis. It is fun, interesting, and a great excuse to create bacon-flavored whiskey at home. The big fat Elvis was created by Jason Westplate and inspired by "The King's" later years when he enjoyed less than healthy foods. You will need to give yourself about a day to prepare the ingredients, but it is worth every minute. For this recipe, you will need to create two infusions: bacon fat-washed whiskey and peanut butter-infused amaretto. Both are quite fun and delicious on their own and you should have enough of the two spirits to make about 16 shots total. When paired with maple syrup and applewood-smoked sea salt, it all comes together for a truly unforgettable party shot. The process for making bacon fat-washed whiskey is not much different than a normal infusion, though it's technically called a "wash." The only exception is that once the wash is complete, you will freeze the whiskey to solidify the fat so it can be strained off. The time for your infusion is going to depend on your love for bacon-laced liquor. If you're not a huge bacon fan, 4 to 6 hours will give a gentle flavor. Westplate says that he likes a "robust bacon profile," so he washes for 12 to 16 hours. You may need to adjust the infusion time if you choose a whiskey other than Rittenhouse Rye 100 Proof. It has a very bold flavor profile and whiskies with a lighter taste may be better with less bacon flavoring. To clarify bacon fat: Combine the rendered fat left after cooking bacon with twice the volume of water (e.g., 1/2 cup of fat to 1 cup water). Bring to a boil, reduce heat, then simmer for 2 minutes. Pour the fatty water into a bowl and refrigerate for 4 to 5 hours (or freeze for 2 hours) until the fat creates a solid layer on the top, which is your "clarified" bacon fat. In a jar with a tight-sealing lid, add 1 tablespoon of clarified bacon fat to 500 ml of rye whiskey (about 2 1/8 cups). Agitate to thoroughly combine and shake it on a regular basis for the desired wash time: 4 to 16 hours, depending on your taste. At the end of your wash time, freeze the whiskey until the fat has solidified. Don't worry, the whiskey itself will not freeze. Repeatedly strain the mix until the whiskey is clear and devoid of solid fat. Use cheesecloth in a fine mesh strainer to make the task a little easier. The peanut butter-infused amaretto is much easier and will take just under an hour to prepare. Use the same method for straining as you do when making the bacon whiskey. 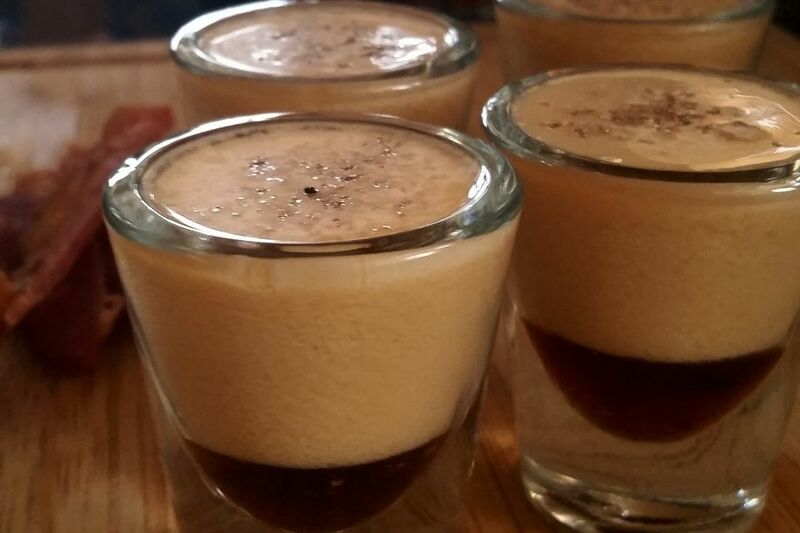 If this shooter is not to your taste, you might want to try the infusion anyway. It's a delicious way to dress up the average bottle of amaretto. In a jar with a tight-sealing lid, combine 1 tablespoon creamy peanut butter with 250 ml amaretto liqueur (about 1 cup). Agitate to thoroughly combine. Let stand for 30 minutes. Strain until smooth. The resulting liqueur will have the texture of a cream liqueur. Add 1 teaspoon of maple syrup to the bottom of a shot glass. In a cocktail shaker filled with ice, shake the bacon-washed whiskey and peanut butter-infused amaretto for about 10 seconds. Strain slowly over the back of a bar spoon to create a layer on top of the syrup. Add a pinch of applewood-smoked salt to the top of each shot. Because this drink includes a peanut infusion, be sure to ask anyone you're serving it to if they have a nut allergy. It can be easy to forget this when mixing up shots, but it's very important. Once you have finished straining the two infusions, bottle them separately under a tight seal until you're ready to make the shots. Using an empty liquor bottle that has been cleaned out with the label removed is a great choice and a good way to recycle. Be sure to relabel it so you know what's inside and when you made it. It's easy to make multiple shots at one time with this recipe. For instance, if you want to make a round of four shots, pour 4 ounces of whiskey with 2 ounces of amaretto into the shaker at one time. How Strong Is a Big Fat Elvis Shooter? The infusions shouldn't affect the strength of the two liquors much, so let's assume they remain at the full bottling proof to estimate this shot's potency. Backed by that 100-proof whiskey, it comes out to a substantial 29 percent ABV (58 proof), making this one of the strongest shots you can mix up.